We regularly feature a lot of Japanese, Korean, and of course, local beauty products here on PV. Personally, those are the ones that excite me the most! Asian Beauty (or AB) has been growing in popularity because, well, there are so many affordable yet effective product options. I also feel they are better suited to the needs of Asian skin, with formulations that are often lightweight and designed to be layered on top of each other. I’ve tried and enjoyed picks from Japanese, Korean, and Pinoy brands but I couldn’t help but get curious when I learned that Taiwanese beauty was going to be the next big thing. I specifically wanted to know more about their skincare and so I was thrilled to hear that Beauty Bar is now carrying a Taiwanese skincare brand - a first for the store! The name 23.5°N was inspired by Taiwan’s location above the equator, which allows the brand’s ingredients to be grown locally and organically! They have a unique “farm to face” philosophy that promises that the plants are harvested fresh and carefully processed so that it stays fresh until it touches your face. This is no easy feat considering that their products are free from parabens as well as fragrances and artificial coloring. Rice is a soothing ingredient that’s recommended for sensitive to normal skin. It has brightening and purifying properties, as we discovered while trying out some Japanese beauty hacks. Red Pearl Barley boosts radiance so it’s best for dry to normal skin types. Oriental Beauty Tea is derived from a plant indigenous to Taiwan and provides a solution for oily and acne-prone skin types. It also promises to minimize visible pores. Bamboo has ultra-hydrating properties that make it a good pick for those with overly dry or excessively oily skin. I got to try a few products from this line. I received a sample pack of the Bamboo line, and here are my thoughts! The Bamboo Ultra Hydrating Facial Cleanser (P1,275 for 120ml) features a foam formula that made my skin feel soft but a little tight. It might simply be that my skin has gotten too used to gel and cream cleansers, though it’s good to know that this is SLS/SLES-free! To avoid wasting product, I skip the cotton pad and simply applied the Bamboo Ultra Hydrating Toner (P1,275 for 150ml) by patting it on with my hands. I like that feels simply like water and doesn’t leave a sticky residue. It might have a mattifying effect as my skin felt soft and powdery after. 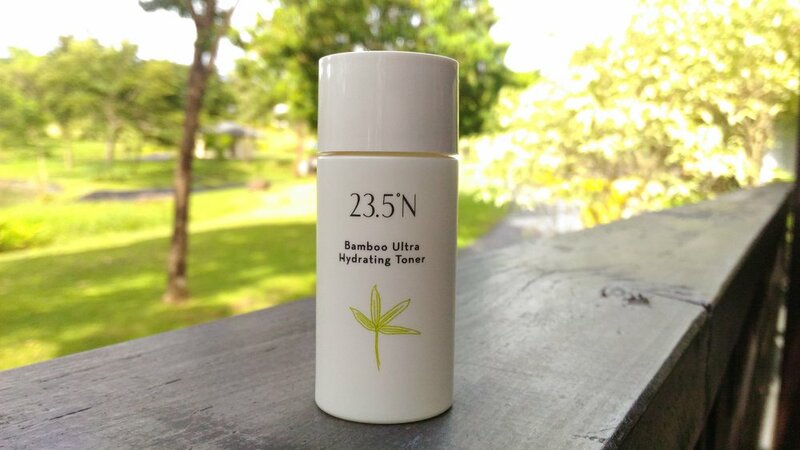 Finally we come to the Bamboo Ultra Hydrating Lotion (P1,550 for 50ml) which follows the Western concept rather than the watery formula usually favored by AB brands. It’s a lightweight cream formula and the only product in this line that carries a subtle botanical scent. Even then, the scent is light and fades away soon after. The Bamboo Ultra Hydrating Gel Mask (P1,450 for 100ml) is an optional step for those looking for even more intense moisturizing experience. A small pea-sized amount is applied all over as a last “sealing” step for a daily routine, or it can be applied generously and left on or 20 minutes as a mask. Instructions say to do a facial massage after masking but I found this difficult to do because the dried mask feels a bit tacky. I end up tugging on my skin so what I’ve found works is to wet your hands with a bit of water to make the mask smooth and pliable again. Overall, I liked my first experience of Taiwanese skin care and appreciate 23.5°N’s efforts to go back to the basics. The ingredient lists are short, the formulas are fragrance-free, the minimalist packaging design looks sophisticated, and even the product names make it easy to understand what each product is for and how to use them. The line’s just perfect for both beginners and those who prefer a no-frills approach to skincare. Which of these lines would you want to try from 23.5°N? Have you tried Taiwanese skincare products before? 23.5°N is now available at Beauty Bar.